You can choose to make the Dundee cake with or without alcohol and using any dried fruit and or nuts that you want. All my recipes are very forgiving and can be adapted for your preferences. It is a very easy recipe; I do it in two stages. Stage one is taking all the dried fruit, and adding one cup of scotch, brandy or any other alcohol on hand to soak the fruit until plump, approx 24 hours. If you are a teetotaller you can use any fruit juice for good flavour. If you are in a hurry, this stage can be omitted. See, really easy! This cake is a hit with anyone who loves almonds and is good with tea, coffee, milk or something harder. Optional 1 cup of scotch or any liquor or fruit juice if prefered. 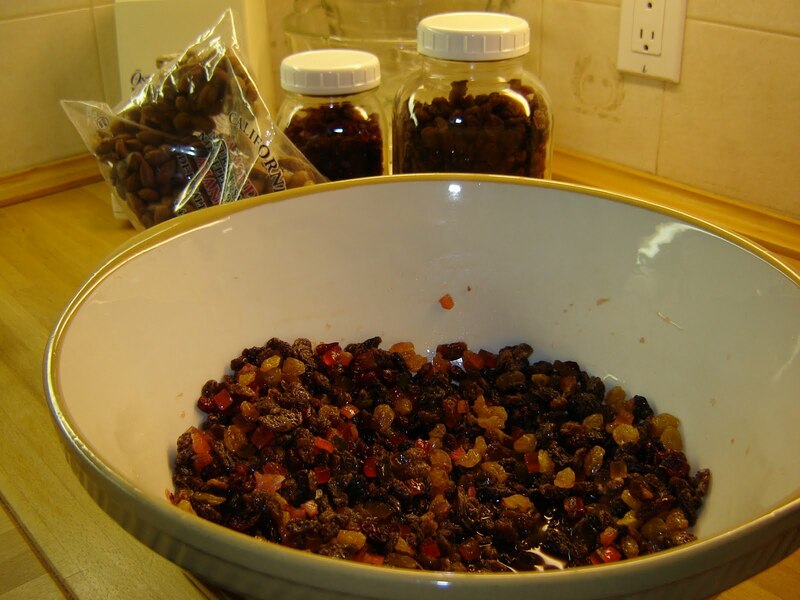 I used dried cranberries, golden sultanas glace cherries and raisins. After soaking in liquid, fruit will be full and lush.